by Gigi D.G. ; illustrated by Gigi D.G. Little sisters can’t save the day—or can they? 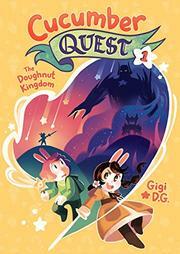 When the nefarious Queen Cordelia takes over Caketown Castle in the Doughnut Kingdom, a hero is needed. Cucumber, a white rabbit with an orange pageboy and a penchant for learning, is chosen, however, he’d rather go to school as planned; indeed, his spunky little sister, Almond, seems better suited for the job. Unfortunately, the Dream Oracle rejects her: “Little sisters aren’t legendary heroes.” Despite parents and oracles, the siblings set out to prove that a hero need not be male. Over the course of their quest in the pastry-themed kingdom, the bunnies meet a silly assortment of similarly food-inspired characters, including a toothless gummy bear and three knights named Sir Bacon, Dame Lettuce, and Sir Tomato. Originally a webcomic created entirely in Photoshop, D.G.’s candy-colored charmer is imbued with a delightfully snarky humor, helping to offset the profusion of cuteness. Gender roles are explored, affirming the notion of staying true to oneself rather than capitulating to the expectations of others. The worldbuilding is cleverly conveyed in bright and dynamic illustrations. Although populated almost entirely by bunnies, they are diversely hued, ranging from light ivory tones to deep, warm browns. Playful aftermatter includes a Q-and-A with the characters, character bios, and a map.